We hit the Barrel Thief for lunch on Sunday with our friends Paul and Warren who were in town for the day. While we were selecting our wines for lunch, owner Ross, pulled me aside and showed me this Barbera that he was raving about, and recommended it to me knowing my love for Piemonte wines. At 30 bones, the 2005 Ronco Malo Barbera d’ Asti was a little pricey but Ross hasn’t steered me wrong yet so I picked it up. 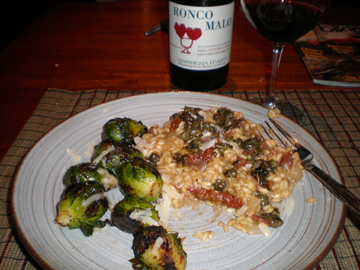 Well organic or not the Ronco Malo did not disappoint, I was thoroughly impressed as we had it with some fabulous homemade (wife made) sun-dried tomato Risotto and braised brussel sprouts. The acidity in the wine paired nicely with the creamy Risotto and the brussel sprouts heightened the cooked veggie notes in the wine and vice versa. With very smooth tannins that I wrote down as leathery but bordered on velvety, you could enjoy this wine by itself or with a dish that exemplifies the flavors of the Piemonte region as I did. Although the 2005 is drinking great now, based on its structure you could definitely hang on to it for a while longer. The next couple of weeks we have some big tastings going on around the Richmond area in addition to the regular Friday and Saturday tastings at the local wine shops. I am really excited about this tasting as regular Anything Wine readers know I am HUGE fan of the Piemonte region of Northern Italy. The Wine Cellar will hold a special big red wine tasting from 6:00 to 8:00 after the store closes. The is $30/person and includes cheese, salami, crackers and other apps. Up for tasting will be 18 big reds ranging in price from $25 to $50 from the West Coast. Some new wineries will be represented, as well as some the hottest big reds currently on the market. I love BIG reds so I can’t wait for this event!! I hope to see you all at these events as they all sound fantastic. IT’S GOOD TO HAVE A FRIEND IN WINE! My good friend John Witherspoon has taught me much about wine. He’s never been off in his recommendations for wines to try and wine bars to visit. The latest recommendation was to visit Barrel Thief in Richmond Va for the Kermit Lynch tasting. The owners of Barrel Thief (Ross and Ned) were in perfect form, handling all the behind the scenes work careful not to intrude upon the ambience of the experience. As typical, Barrel Thief does not disappoint. The French visiting winemakers had stellar selections, and in the end, it was hard to make a choice for what to bring home. I have to confess as well that I have been disappointed by the French wines I’ve tried. My flavor profile seems more akin to Spanish wines, Argentina Malbecs, and Cabernet Sauvignon from the Sonoma Valley. Needless to say, this experience has opened my palate to a whole new world of wine, and my husband and I visited that world last night with a bottle we bought, The St. Joseph VV. As you see from John’s blog on April 25, 2008 the St. Joseph VV 2005 is a wine made from 60 year old vines of 100% Syrah. The alcohol content is 13%. On the back of the bottle is a statement from Thomas Jefferson, which I couldn’t agree with him more: “Good wine is a necessity of life for me”. On the nose is a slightly overpowering woody cedar spice so I couldn’t really detect anything else. This same spice hits you in the first taste, but soon the cranberry comes through, and on the finish the experience turns to a dusty and earthy note. Overall I really liked the wine. It was definitely unique to anything I had previously tasted. For the first time, the following Friday at our usual tasting at the Caboose in Ashland Va my husband and I visited the selection of French wines and picked out a nice Sancerre. Perhaps I’ll write about that one in the future, but I wanted to get this one out there for my good friend John to help celebrate his Birthday in the only way I know how, and that is to celebrate the enthusiasm of wine with him! Thanks John and have a great Birthday! P.S. For all you wine and beer lovers in the Richmond area, the Caboose in Ashland will have a beer and wine tasting special (free tasting of 5 wines and 5 beers) on Friday June 6. Come out and visit Ian Kirkland who’s been an owner there 10 years now. Sample exquisite cheeses picked out by Shannon Cook and experience this quaint little shop by the railroad tracks in the old town of Ashland. Last night I attending the Kermit Lynch tasting at the Barrel Thief in Short Pump, and as the email promised, it was HUGE. Now Kermit Lynch himself was not there but 5 of his top imports were represented via the winemakers, who were there pouring their juice for us to try. For 10 bones we got to taste over 18 wines from the Rhone region, what a steal. I was not able to taste all the wines as they ran out of a few and I ran out of time, but the ones I did taste were fantastic. To accompany the tastings were some nice cheese and salami slices (didn’t try cuz of the whole vegetarian thing) and some nice baguette slices to help clean your palate in between tastes. To see what I thought and what I bought keep reading. 2007 Tavel $25 – A dry Rose comprised of 45% Grenache, 24% Cinsault, 15% Clairette, 6% Syrah, 4% Grenache Blanc, 4% Mourvedre and 2% Bourboulenc. Very full and round Rose with strawberry and salmonberry flavors and aromas that led to a stony, mineral finish. I would have bought this but they don’t actually have it in for sale yet. St. Peray Blanc (3 vintages) – St. Peray is a small appellation in the Northern Rhone, South of Crozes-Hermitage producing white wines from Marsanne and Rousanne. The Blanc’s from Clape are 100% Marsanne with fermentation done in cement vats and aged in stainless steel. All the vintages were medium to full body, good fruit and moderate levels of acidity with the 2004 have lower acidity than the rest and a darker golden color (to be expected). These were very nice wines and it was awesome to taste the vertical. Cotes du Rhone (3 vintages) – Made from 100% Syrah with whole cluster natural yeast fermentation in cement vats with 10 months ageing in large French oak casks, bottle fined and unfiltered. 2007 $45 – Blueberry and black cherry on the nose followed by raspberry eucalyptus and “dirt” on the palate, good big body with strong leathery tannins. 2006 $45 – Earthiness, blackberry and leather predominately on the nose with dark fruit and mint with a touch of green olive in the mouth – a years difference was definitely noticeable in the slight smoothing of the tannins that I would define as dusty. 2005 $45 – Barny, raspberry, cherry and slight funk on the nose with collard greens raspberry and earth rounding out the taste profile, firm tannins at the finish although extremely soft and well balanced across the mid palate. This was my favorite of the 3 and one of the wines I took home. 2005 Cornas Cuvee Renaissance $ 79– 100 % Syrah with same processing as above except for 20 months of aging in French oak casks. This wine had amazing blackberry pie and floral aromas, green bean, fig and licorice flavors. Fairly smooth tannins and full bodied structure. 2005 Cornas $119 – This wine is the exact same as above except from a different vineyard lot that is comprised of 60 year old vines. Another heavy hitter at $119, very rich with cranberry, currant, tobacco aromas that followed through to a similar taste profile with a bit of green pepper thrown in and a hint burnt rubber. HUGE TANNINS at the finish – definitely need about 10 years before this one really shows its potential. 2006 Condrieu Blanc $89 – did not try I wish I had because I love Condrieu wines. 2006 Syrah $29 – 100 percent Syrah – strawberry and rose on the nose with mostly a pure cooked green bean flavor on the palate. 2006 Cote Rotie $79 – 85% Syrah and 15% Viognier – Barny, earth, raspberry and floral notes. The Viognier gave the wine noticeably more viscosity and the floral aromas were very nice. I would have bought this but they didn’t have it in stock yet. 2005 Chateauneuf du Pape “Mourre de Pedrix“ $65 – Comprised of Grenache (69%), Syrah (15%), Mourvedre (15%) and Cinsault (1%). Aged in both oak barrels and large tanks for 12-18 months and bottled unfiltered. I got cake batter aroma on the nose as well as earth, cassis and a hint of fresh dill. On the palate I got similar flavors with green olive making another appearance and the earthiness became more evident. Magnificent body and structure, firm leathery tannins that will take quite a few years to smooth out. This was a great wine and the second bottle that I decided to purchase. 2005 Chateauneuf du Pape “Vielles Vignes” $75 – Comprised of 70% Grenache and 30 % Mourvedre. Toast, blackberry, sulfur on the nose with blackberry and tobacco flavors on the palate. Good body and firm tannins but not overly so. The event seemed like a success (to me) with a good size crowd turning out for the tasting. I know myself and the few people I brought from work sure enjoyed our time and the opportunity to taste some pretty pricey wines of great caliber. Good job Barrel Thief team, I look forward to the next one! If you haven’t already, make sure to stop by the Barrel Thief for some great wine and food or just to browse their selection.